Ebbe Sand, founder and master coach of Ebbe Sand Soccer Academy, has been announced as the sports director of Brøndby IF, starting on January 2019. The former attacker is proud to have the opportunity to return to the club where his own career took off in the 1990s. “First of all, it’s a big day, it is a great opportunity. I’m honored and I’m looking forward to getting started. I will do everything in return for the trust I have been shown”, says Ebbe Sand. Ebbe Sand has a great career behind him, and in the 1990s he played for the Brøndby team and won three Danish championships. Since then he switched to German Schalke 04 and played with the Danish National Team during 2 world cups. 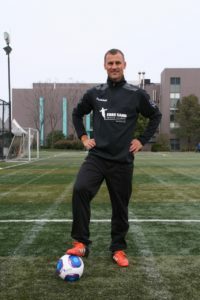 Ebbe Sand was employed in Silkeborg after his active career, where he had a number of different roles from 2006 to 2007. Among other things, he funded the Ebbe Sand Soccer Academy to support children into achieving their sports passion and dream. During the 4th game week, we were very excited to see all the hard work of the trainings reflected on the field. We had great games, goals and a lot of talent on display.